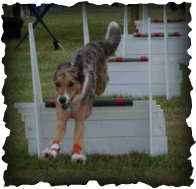 Why did we (Derek and Kathy) start flyball? Well, it was Colin`s fault. 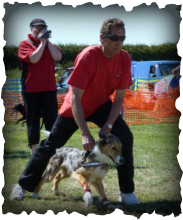 In 2002 when we took our pup Bonny to obediance classes Colin said to Les "Looks like a future flyball dog there Les!". In 2007 Dylan decided to come and join us when we went to a competition at Mona. 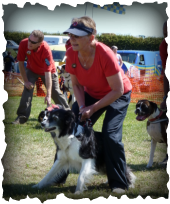 He soon joined Bonny enjoying himself at flyball then in 2010 along came Jensen who found us at Carlton Towers. Despite being one of early members of the team, Kathy has only recently started handling. Their experienced collie 'Bonnie' is showing her the ropes and i like to thing that Kathy is enjoying the occasional break from ball collecting. Supporting Bonny, Dylan and Jensen we also have Jazz the 15 year old Whippet who attends all the competitons. 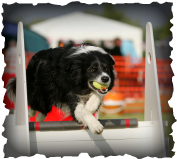 Bonny took to flyball straight away and enjoyed it a lot more than obediance where she thought the idea was to attack all the other dogs. She's mellowed with age but doesn't think she should have to slow down just yet! My name is Mr.Dylan and i came along during the puppy boom that lead to the creation of the Fylde Babies starter team :) For a long time i was by far the fastest dog in the fylde coasters team and used to love glancing at the other lane as i crossed the finish line to see how far behind my opponent was! Being quick and reliable i was generally used as the 'anchor dog' as i was most likely to be able to catch the other team if we were behind :) The further behind we are - the faster i run! Since the arrival of Jensen though, i've decided to throw the toys out of my pram and twirl my way to the start line (which adds almost a second to my time) I think i'll maintain this protest until Dad gets rid of Jenson and i can go back to being 'his boy' again! Jensen is Derek and Kathy's newest arrival. 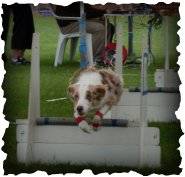 Like Mr. Dylan before him he was a spur of the moment decision, but unlike Mr. Dylan he was bought with Kathy's approval :) Jenson is a super collie from Canen lines and jumped straight into the top team with his fellow musketeers Seth and Theo. He's not quite as fast as Dylan when the latter is at his best, but as Jenson doesn't twirl and faff his place in the top team is well deserved!